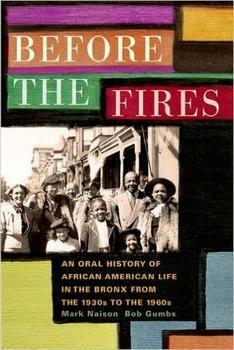 Before the Fires is the first book documenting the African American experience in the Bronx during the years when the Bronx was seen as a place of hope and opportunity for Blacks and Latinos. Consisting of 16 oral histories whose narrators, ranging from teachers to musicians, share personal stories with almost cinematic vividness, it describes vibrant communities erased from memory by the fires and disinvestment which beset the Bronx during the 70s and 80s. These neighborhoods, the largest and most important of which were Morrisania and Hunts Point, not only had a unique mixture of cultures and ethnic groups, they produced more varieties of popular music than almost any communities in the nation. This book forces us not only to revise our understanding of Bronx history, it will inspire a new look at urban African American history during and after World War II, when black communities in many cities were anchored by strong institutions, had vibrant business districts, and were able to make public schools and public housing serve their interests with surprising effectiveness. Unsparing in its look at the way racism limited where Blacks could live, shop, seek work and even safely navigate by bus or on foot, “Before the Fires” brings to life a time when Black families in the Bronx were able to find and create opportunities for themselves and their children in neighborhoods that were far more multiracial and had stronger public institutions than they have today. Mark D. Naison is Professor of History and African American Studies at Fordham University, where he also directs the Bronx African American History Project. He is the author of three books, including Communists in Harlem During the Depression. Bob Gumbs is a graphic designer, photographer, artist, book publisher and author. Born in Harlem, New York and raised in the South Bronx, he has published and is the author of a number of books on African American history and culture. His art has been exhibited in several art exhibitions in New York City.